Absolute Being, Para Brahman, manifested as Absolute Space, Desa Brahman and as Absolute Time, Kala Brahman. Then It mixed with Light, Prakasha Brahman and Sound, Nada Brahman and the Five Elements and became the manifest Universe, His relative aspect ( Apara Brahman ) ! This is the Brahman and Maya of Vedanta and the Prakriti and Purusha of Sankhya. Devi is She, the manifest Divinity of the Unmanifest. And She deceives even the Wise ! As Maha Maya, Grand Illusion ! 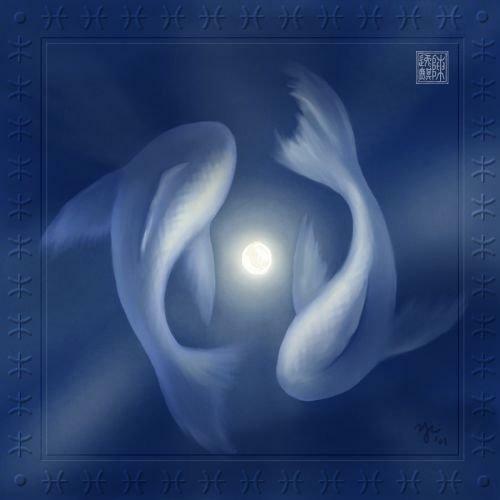 The main festival here is when the Sun enters the 20th degree of Pisces or Meenam and is celebrated as Nenmara Vela. 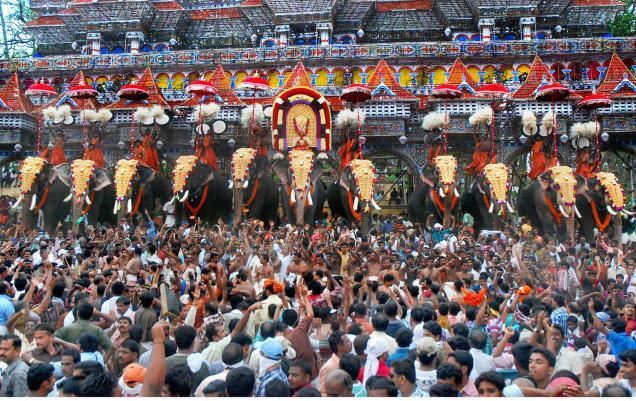 This is one of the biggest festivals in Kerala and lots of elephants take place in this Pooram ! Belief in a Tutelary Deity is a must for those who seek Self Realisation, as the path to the Unmanifest is rugged and difficult. Here are some verses from the Master Philosopher and Poet, Sankara. 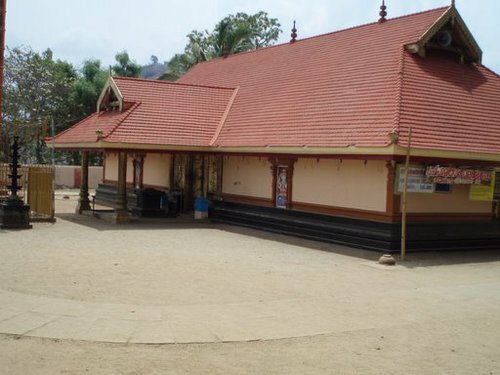 ( Nirvana Dasakam ). To the sublunar world ! By whom all things be ! Me, you or world I am not ! That which remains after Negation ! The Oldest Esoteric Symbol. Commonly known as the Star of David , the Emblem of Judaism, this symbol is common in Yantras. 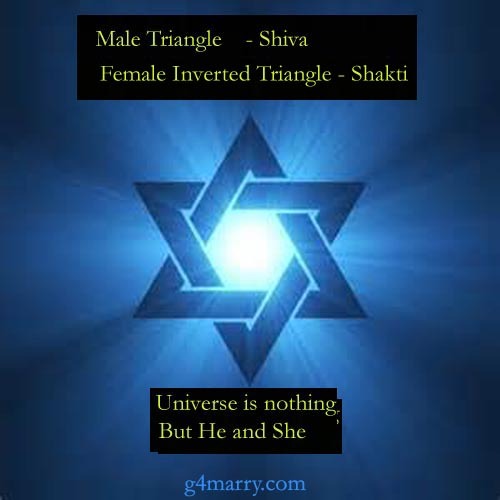 Sri Yantra has 4 Shiva Trikonas ( triangles ) & 5 Shakti Trikonas. Totally 9 triangles ! This Hexagon or Six Pointed Star is known as Shanmugha in Sanskrit. The two major mantras - Aum and Hreem- are embodied in this esoteric emblem. Consciousness and Force, Being and Becoming, Absolute and Relative, Infinite and Finite, the One and the Innumerable, the Formless and then a delirium of Forms He and She, two in one, inseparable, Shiva shaktyatmakam viddhi Jagat etat Characharam. Thi s is the noblest, holiest and the greatest of all sciences. The most original Science of the human race which contains all the primitive mysteries of Science !